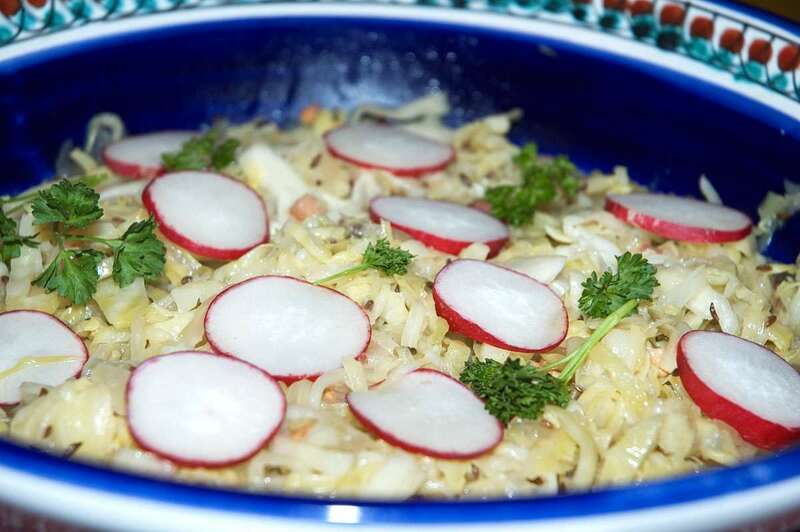 This is a recipe for Krautsalat (German-style cole slaw). It's a salad made of green cabbage with butter, bacon, onion, beef stock, caraway seeds and vinegar. Set large heavy pan over medium-high heat. Melt butter and add the bacon and caraway seeds. Cook until the bacon starts to brown. Add sugar, cook until lightly browned. Add onion, cook until softened and translucent. Add cabbage, stir to coat well with the fat. Add salt. Add beef stock and white wine vinegar. Cover and bring liquid to a boil, cook for 2-3 minutes, then remove from heat. Add vinegar, stir well, season to taste with salt and pepper. Let cool and refrigerate for at least 4 hours, better overnight. Before serving, check seasoning, add salt and pepper if necessary. Garnish with sliced radish and parsley. This recipe is inspired by my Mom's recipe for Krautsalat. Step 4 in Preparation calls for adding white wine. There is no white wine in the ingredients list. Step 5 calls for adding vinegar. I assume that this vinegar is the "white wine vinegar" in the ingredients list. I have made this recipe without using white wine and it works fine. However, I do feel the recipe is improved by adding a few cloves of chopped garlic and a couple of pinches of ground red pepper or Cajun spice. Thanks a lot - that should indeed have been white wine vinegar. I corrected it in the recipe. I've made this recipe several times, and it's great! My only adjustments: remove most of the fat from the bacon before cooking it (doesn't make the salad so "clumpy" later on) and add a bit more vinegar than the recipe calls for. Other than that, it's a real winner!